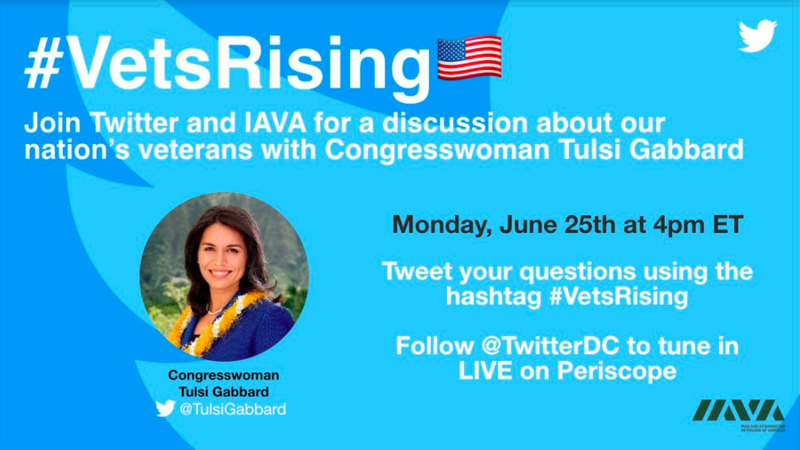 Washington, DC (June 22, 2018) — On Monday, June 25th, @IAVA will partner with @TwitterStripes and IAVA-generation veteran and Hawaii Congresswoman Tulsi Gabbard for a landmark #VetTogether in Washington, featuring a discussion of the most pressing issues facing our nation’s veterans. Streamed live on @TwitterDC and @TwitterStripes to millions, the activation and conversation will bring unprecedented light to IAVA’s community and Big 6 advocacy priorities, including burn pits, medical cannabis, and combatting veteran suicide. Rep. Tulsi Gabbard, a Post-9/11 veteran and recipient of the 2017 IAVA Salutes Veteran Leadership Award, is leading the charge on numerous IAVA initiatives and legislation for veterans. As a next-generation veterans organization, IAVA leverages technology at the highest levels to advocate for veterans and make our first-class research and advocacy work accessible and actionable. IAVA’s partnership with @TwitterStripes exemplifies the power our community has to reach new audiences to fuel our mission to connect, unite and empower veterans. It’s building on our long history of technology innovation and breakthroughs to continue to serve as the vanguard of the veterans movement. “@IAVA is very proud to partner with @TwitterStripes and Rep. Gabbard for this innovative #VetTogether. This conversation, streaming live to millions on Twitter, will provide critical momentum for our policy priorities. And serve as a highly-innovative wake-up call. At a time when veterans continue to be used as political props and tools, we’re grateful for Twitter and Rep. Gabbard’s commitment to elevating IAVA’s authentic veterans voices and providing platforms for our movement to push forward and grow,” said Paul Rieckhoff, Founder and CEO of IAVA. Press: This event is open press. Please contact press@iava.org to attend. In 2018, IAVA’s focus is on 6 priorities that our members see as most pressing. This “Big 6” contains the challenges and opportunities that IAVA members care about most–and see as areas where we can uniquely make an impact. IAVA is building on our core four policy priorities from 2017 to elevate and introduce to the nation two long-standing issues that are extremely important to our community. IAVA members are poised to educate the public, design solutions for positive impact, and lead the way to the future. Each campaign will drive toward outcomes in 4 key areas: 1) Public Awareness 2) Executive Action 3) Legislative Change 4) Local Support.